Hey, diddle diddle! Anyone seen a cat playing a fiddle? And where on earth did the knife and spoon go? 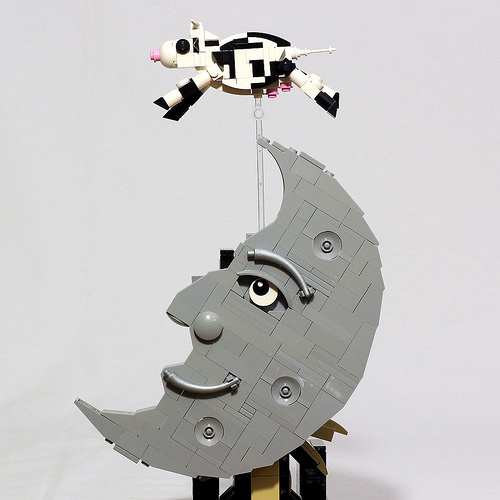 I’ll bet Jason Allerman knows, since he’s gone and built this lovely sculpture of the cow and the moon. I’m quite partial to the detail of the moon, and that sly grin. The cow reminds me of a small chain of chicken restaurants who encourage us to eat more poultry. The ski pole as a tail is pretty neat. TBB has featured a number of Jason’s builds in the past, including his holiday helper cookie robot and Sisyphus, and I’d encourage you to check out more from his flickr stream for other excellent creations.